Mold is a fungus that thrives in moist or wet areas, including inside of your home. The basement and the bathroom are two of the most common rooms for mold growth, yet it can breed anywhere that moisture is present. Not only does mold look and smell bad and cause damage to your home, but many people also develop allergies to mold that cause them to sneeze, have runny noses and red eyes, and develop breathing problems. If you’re experiencing allergies even when you’re inside, it might be a good time to determine if mold growth in the home is the culprit. Mold is often found alongside the bathtub, on the sink, and growing along the walls in the basement. Mold can resemble dirt or grout and ranges in color from a dark black to a deep green. There is often a distinct musty odor where mold is growing. Sometimes this smell is the only sign of mold, especially when it is growing behind your walls and cannot be seen. You should hire a home inspector who uses a thermal imaging camera and moisture meter if you suspect mold growth, but have no visible evidence of the problem. These tools can provide insight into a mold infestation and help figure out the source of the growth. When mold grows in the home, it is breeding spores that fill the air. This is what causes the moldy, musty odor that you smell when you have mold in your home. These spores get into the lungs when they’re breathed in and can contribute to a range of health problems. Headaches, dizziness, and congestion combined with worsened allergies when indoors are all signs that indicate the presence of mold. Although OTC treatments are available to help alleviate some of the symptoms, eliminating mold completely from the home is the only way to stop the allergies from affecting your life. Take immediate action if you suspect mold growth in the home, even if you can’t visually confirm its presence. You certainly do not want mold growth to persist and further damage the home and impact your health. Professional mold remediation companies have tools to safely remove mold growth. 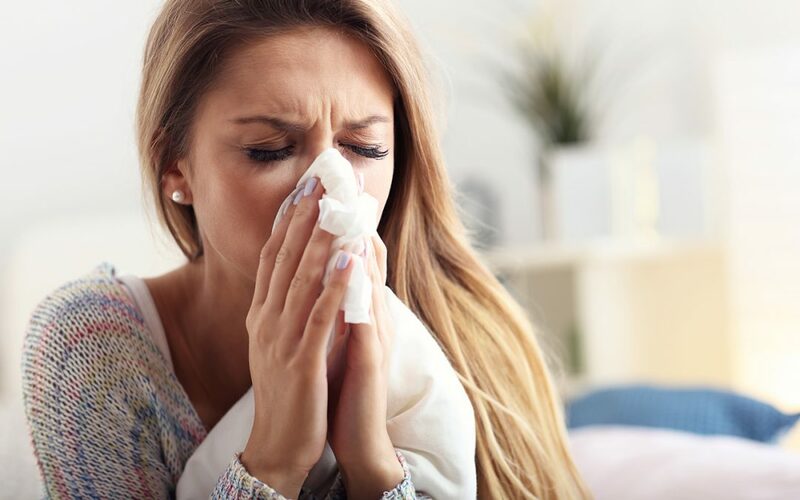 If you’re experiencing allergies, especially when inside your home, it’s time to consider that you may have allergies to mold. Look out for the signs of mold and contact a professional home inspector and mold remediator if you suspect a mold problem at home. Eagle 1 Home Inspection Services uses a thermal imaging camera and moisture meter in home inspections. Contact us to book an inspection in San Bernardino County, Riverside County, and the surrounding areas.